The shade on the left is a traditional Roman shade that lowers from the top down. The one on the right is positioned so the upper part of the window stays clear allowing privacy and some light in this bathroom (raises from the bottom up). Two different shades? No, this is the same window! I've often ordered and installed Top Down/Bottom Up shades from Hunter Douglas (tm) but I'd never made this type of shade myself. I'd always made my Roman shades the traditional top down variety. This bathroom window was the perfect opportunity. The window is mounted high off the floor. She can keep the shade at about half way up from the bottom and still have all the privacy she needs yet get natural light. Otherwise, the bathroom shade would have to be lowered often or people just tend to leave them down all the time and not enjoy natural lighting. 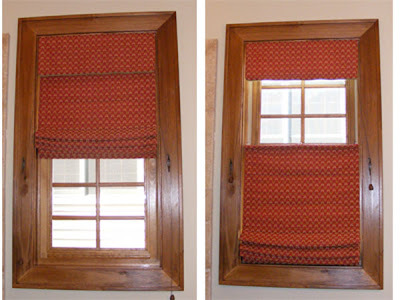 It is also important if you have Roman shades to move the position from time to time so you don't collect mildew. Thought you might like a peek into my real job here. Tomorrow I'll return to papercrafts. First time on your site. Love this window treatment. privacy & light.great solution. It is a very innovative concept in which a window can work as a door also with the help of shades. It prevents the extra sunlight causing glaring problem.There is a variety of shades available in the market so a buyer is free to pick and choose the color and design of their own.